HO HO HO! We have only just gone and got us a pop up shop over Christmas! Amazing artisan bakery Seven Hills Bakery (who by the way make breads and cakes to completely die for) are expanding and have taken over the Sharrow Marrow premises on Sharrowvale Road. As part of their new venture they have given us a space in their new premises for a Campbell's pop up shop over Christmas and we couldn't be more delighted to be working with them. 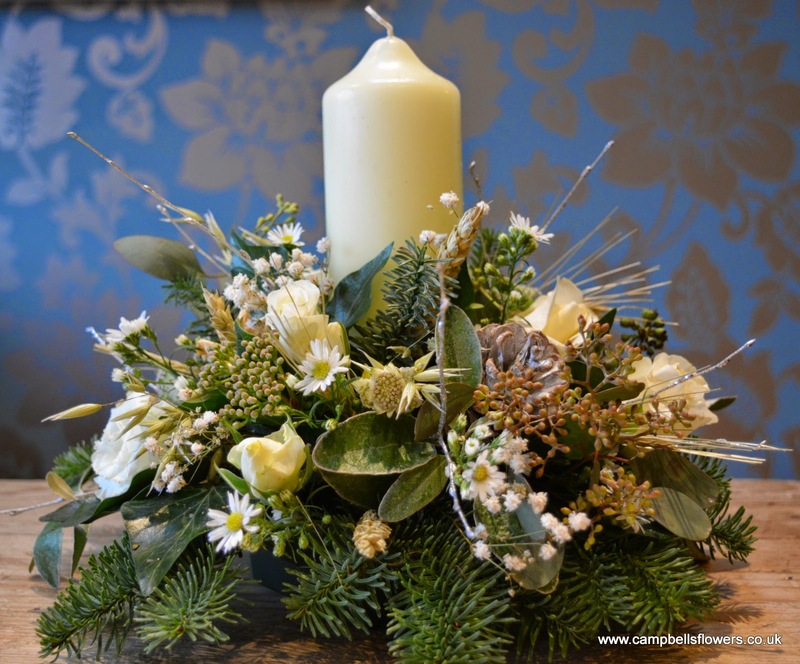 Table centre pieces ranging from £20.00 - £35.00. So this year at Campbell's HQ we have been busy little elves making Campbell's very own Christmas wreaths ready for the festive season. They are very much in keeping with the Campbell's style and ethos using natural materials where possible, some of which we will be foraging locally so keep your eye out for us and say Hi. We do have to use a bit of wire to keep it all together and a bit of ribbon, well, because it's pretty so bear that in mind before you pop it into the compost heap in a couple of months. We are making them to order so they are nice and fresh for you and will last you well into the New Year. They are available in a choice of two designs, with a choice of ribbon too. 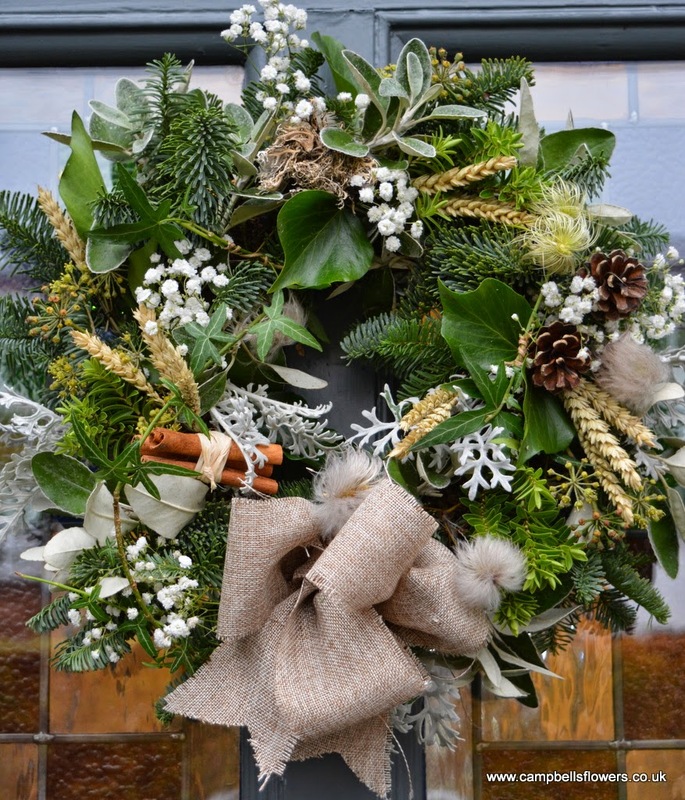 Firstly there is a medium size rustic style wreath including cinnamon sticks, pine cones, wheat and choice foliage. These are £30 each. So as the nights draw in and the winter weather looms grab a hot chocolate, put your onesie on and have a read of our blog. Today I am counteracting winter with a lovely wedding from this spring. 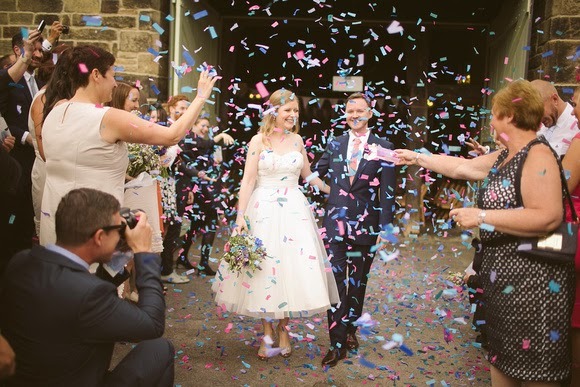 Anna and Sam got married last May at Heathy Lea on the Chatsworth Estate, if you have never been it is well worth a trip out as its absolutely beautiful. Such a great location for an outdoor wedding. Anna is a massive fan of flowers and was very clear that they were to play a huge part in her wedding and we were only too happy to oblige. It was like a dream come true for us. Anna wanted a wild, oversized bouquet with trails and wanted to keep with flowers that were in season if possible. Being a fellow flower lover it was hard for Anna to choose but in the end the bouquet included lily of the philadelphus, David Austin roses 'Patience' and 'Keira 'varieties, white lilac, stocks, larkspur, 'creme gracia' spray roses, cream wax flower, asparagus fern, green bell and 'hypnose' rose. 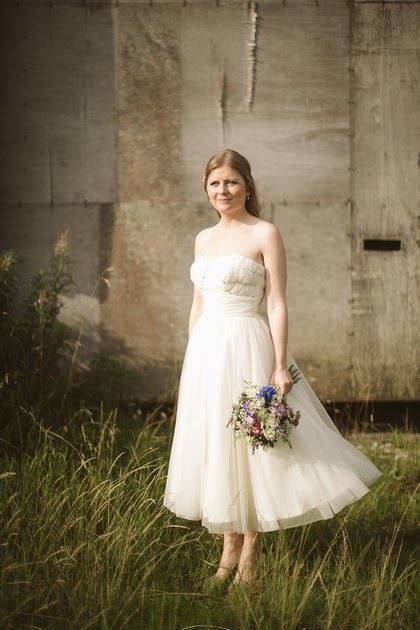 Anna also went with a stunning bridal crown which complimented her dress and bouquet beautifully. The Wedding Industry Awards 2015 - T and Amy's Big Night Out! It's not often I get to open a blog post with a whoohoo, but I can hardly contain my excitement at the moment! As I'm sure many of you know, on Monday Amy and I travelled up to North Yorkshire to attend this year's TWIA awards at Middleton Lodge. 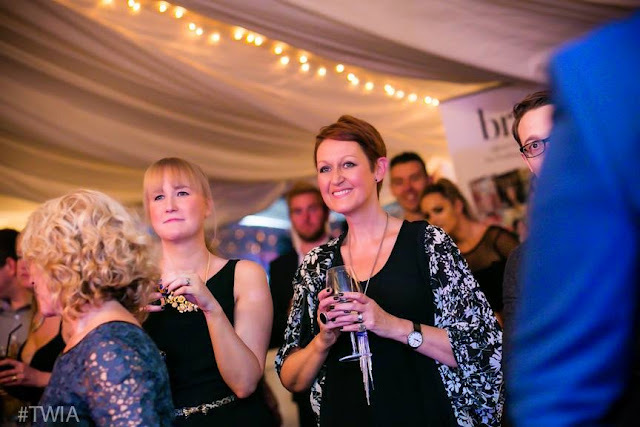 A few weeks ago, scarily close to the deadline, we were nominated by one of our fabulous brides in the Best Wedding Florist category for this year's awards. So, Team Campbell's rose to the challenge and got in touch with as many of the wonderful couples we'd worked with as we could. And they voted. Lots and lots of them. It was really wonderful. The alert on my email just kept on pinging away every time someone voted. So, although we don't get to see what you've said, it is just lovely to know who's taken time out of their busy lives to vote for us. For which we'd like to say a ludicrously huge, THANK YOU! It's been an amazing year. Our awesome team has grown and we've had the real honour and pleasure to work with more of you than ever. And we just can't believe that we've managed to win this highly prestigious award two year's in a row. Astonishing! So thank you once again to Mel, Amy, Soph and Izzy and all you lovely people who make this the best job I've ever had. Roll on London and the nationals and up the North! 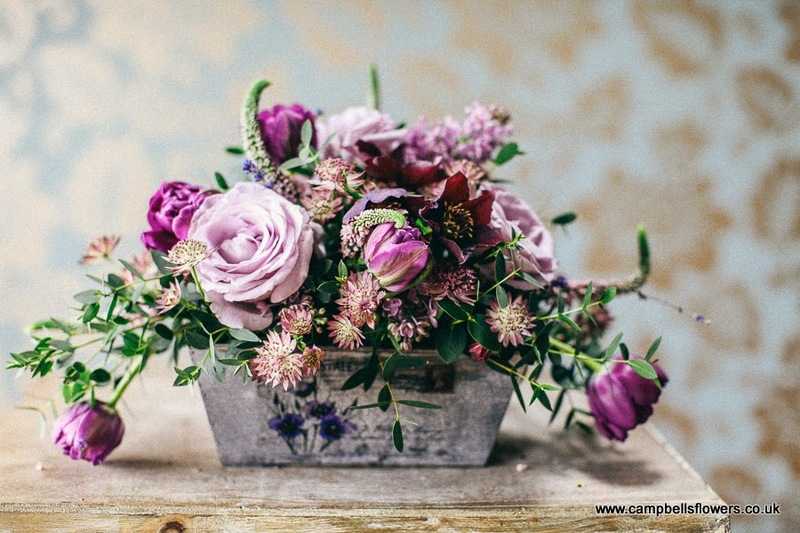 So, it's been a little while since I have I have had the time to bring you a blog (we have been rushed off if our feet here at Campbell's HQ) and what better than a photo shoot to get back into the swing of things. 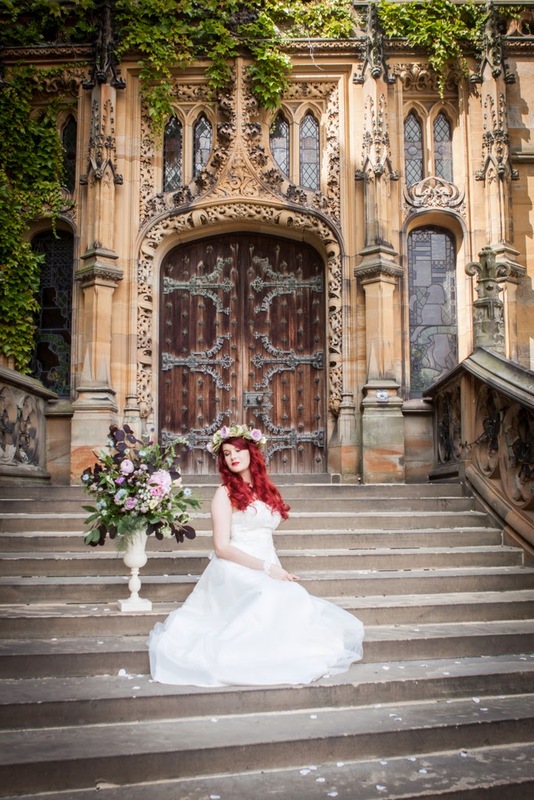 T was lucky enough to involved with this stunning shoot at Carlton Towers with the amazing KMR Bridal. Here is what T had to say about working on the shoot and the inspiration behind her floral designs. 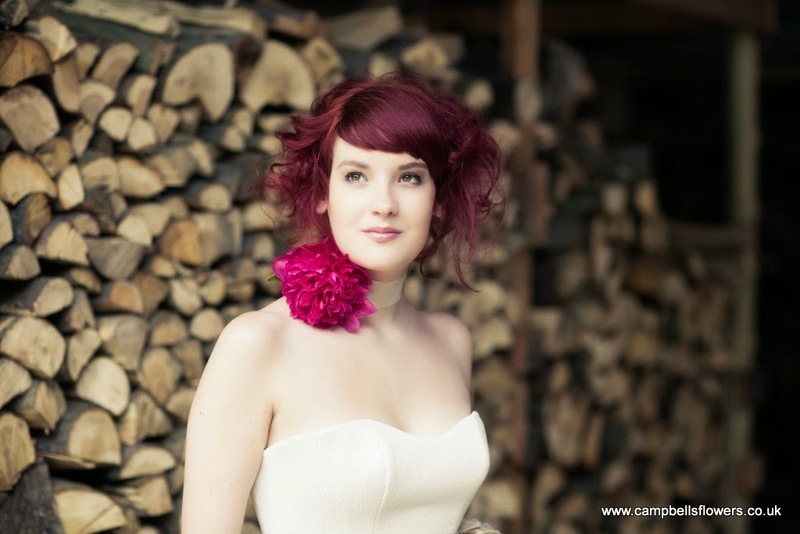 "I was thrilled when Kelly contacted me about the shoot - we'd met a few months previously at a wedding fair where my daughter was wearing one of my floral crowns! We'd both loved each other's design style and aesthetic and had agreed to collaborate at some point. When she told me the shoot was to showcase her latest collection, at the fabulous Carlton Towers, I jumped at the chance." Hello all! Today, rather than talk about all things weddingy, I thought I'd bring you a feature I wrote recently for my good friend, Kelly at Boho Weddings. I met this lovely lady shortly after I started Campbell's Flowers. We immediately hit it off and since then I've been lucky enough to be asked to write for her on a fairly regular basis. 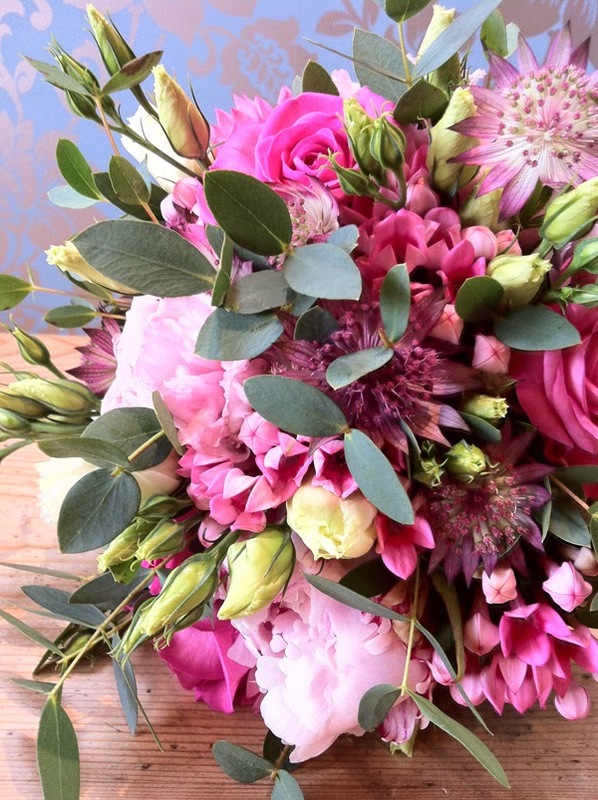 So, on the off chance you missed my latest post, I've put together a list of handy hints and tips of how to get the best from your beautiful blooms, whether it’s your special wedding day bridal bouquet or if you’ve been lucky enough to receive a gorgeous hand tied thank you or anniversary bouquet. I'm just popping onto the blog with some really exciting news. During August I was contacted by a very lovely freelance journalist who had seen our website and wanted to have a chat with me about a feature she was putting together for Prima magazine. Some while ago, the editors at Prima had asked their readers what their dream job might be, given the choice. One of their top four choices was a florist and the magazine was really interested in women who had had a change in career. After a really long chat and phone interview, followed by a couple of additional interviews by phone and email, I heard from the picture editor at the magazine who happily was interested in featuring me so we organised a photo shoot with one of her favourite London photographers, here at the studio. What excitement! It was a really brilliant day, the photographer, Thomas, was absolutely wonderful. 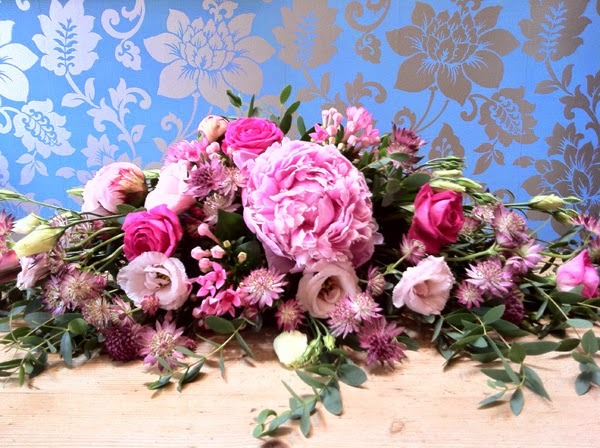 We hit it off straight away and he was totally brilliant at putting me at ease - we were so chilled we even got Lily whippet into a couple of shots surrounded by beautiful British grown blooms we had ready for one of that weekend's weddings. 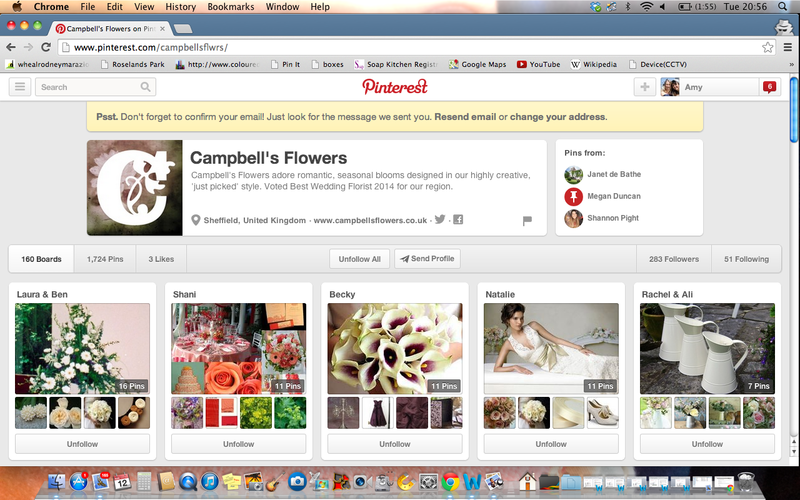 So things are really hotting up here at Campbell's HQ and we are so pleased to announce that we now have a team!!!! That's right T no longer has to run around like a crazy woman doing everything all by herself as we are now here to take over some of the work, hurrah!! 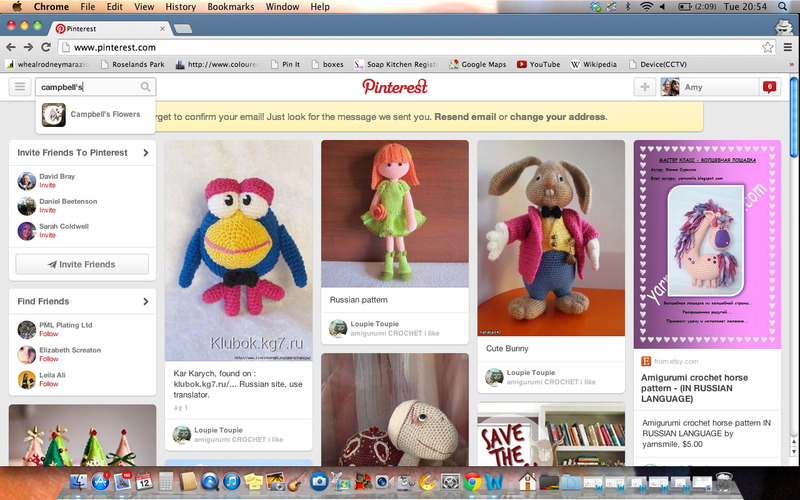 This blog is pretty much an introduction to all of us so you can get to know and love us. T set us a few questions so you could find out a bit more about what makes us tick and we all took part in a photo shoot which we all managed to pretty much giggle our way through. Feature Flower - Everything's Coming Up Roses! So this month after much deliberation we have chosen the rambling Rose as our feature flower. 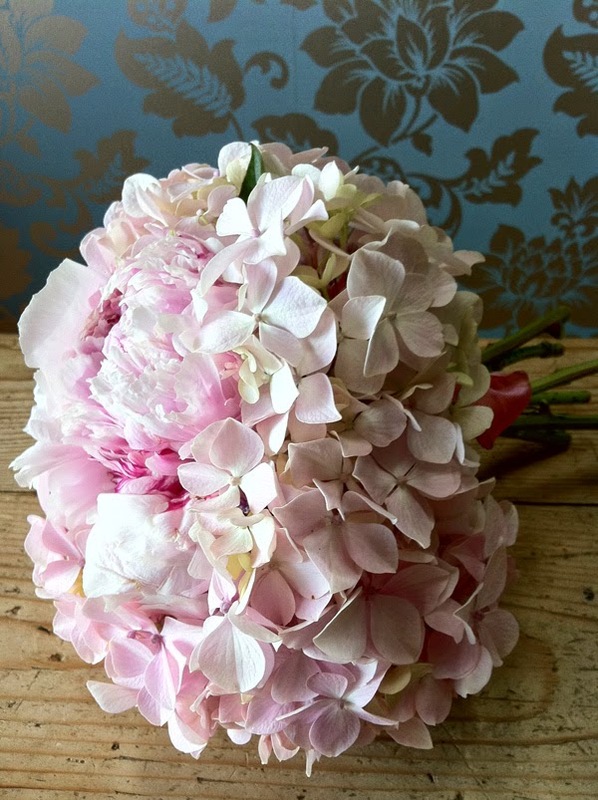 They are a firm favourite with our brides, a classic flower which changes with time and never seems to go out of fashion. The oldest Rose is thought to be over 1000 years old and still grows on the side of Hildesheim Cathedral in Germany. We adore roses as they're so versatile, working well for lots of different designs from buttonholes to hair flowers as they perform really well out of water. Tasha and Oli - Hand Painted Silk, Maps & Thunderbirds! Todays real wedding is that of Natasha and Oli who got married in April this year. They managed to get the best weather for it as it turned out to be a cracking day. They got married at The Royal York Hotel in you guessed it........York! A stunning mansion style building has amazing gardens that overlook the city, which if you get the weather for it, (which Natasha and Oliver did) makes for an amazing back drop. 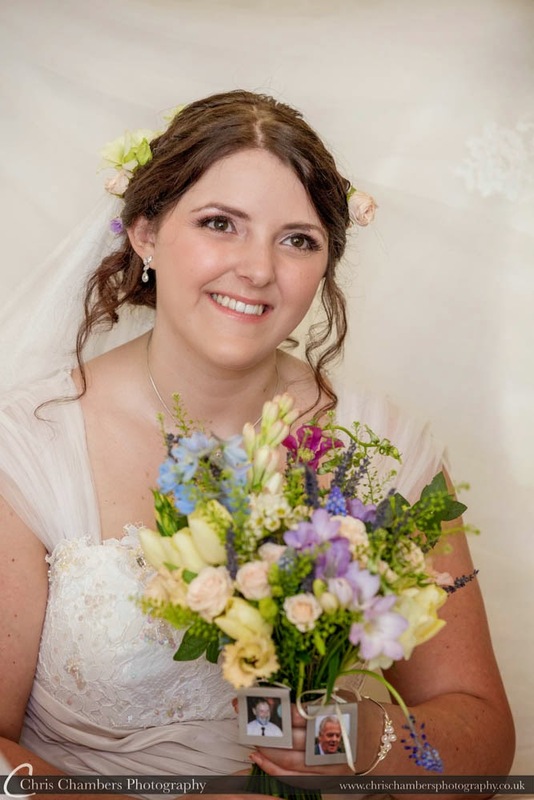 For the brides bouquet Natasha chose pastels, ivories and champagnes with a hint of blue. 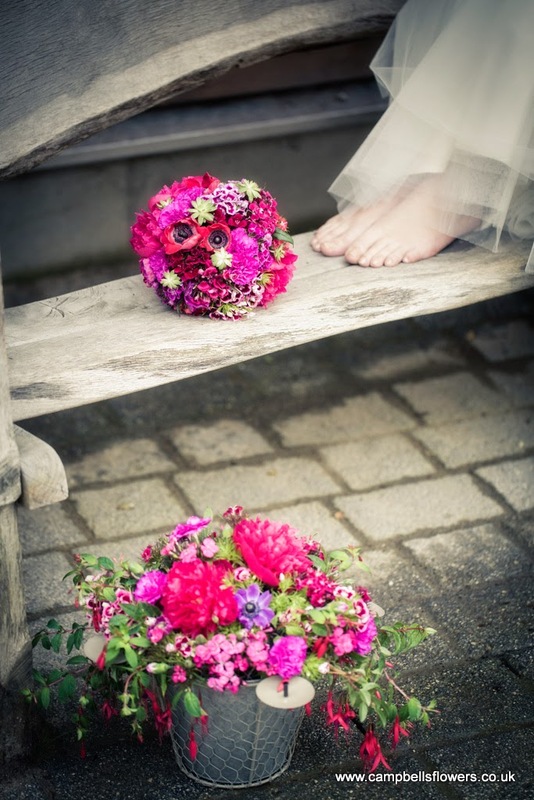 She wanted a natural, 'just picked' hand tied using seasonal, highly scented blooms which I think T captured perfectly. 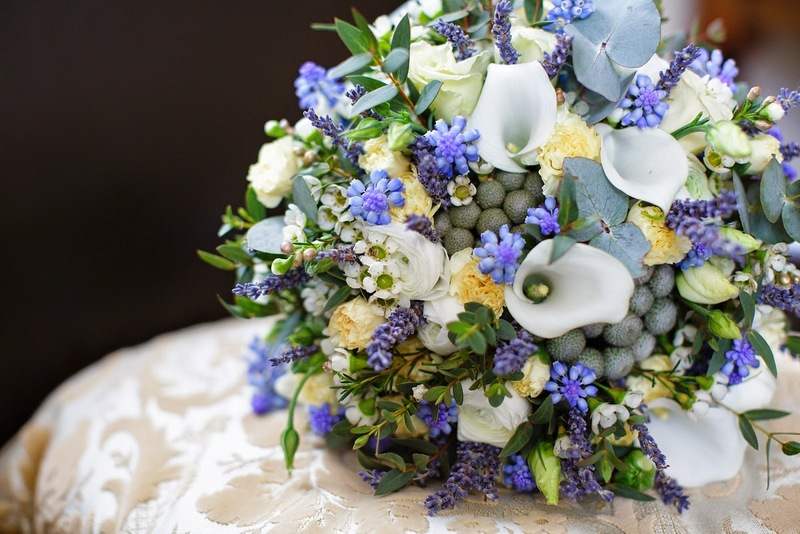 The bouquet included Yorkshire lavender, crespedia, small tulips, scented narcissus, astrantia roma, pale pink double lisianthus, bluebells, freesia, ranunculus and green bell. 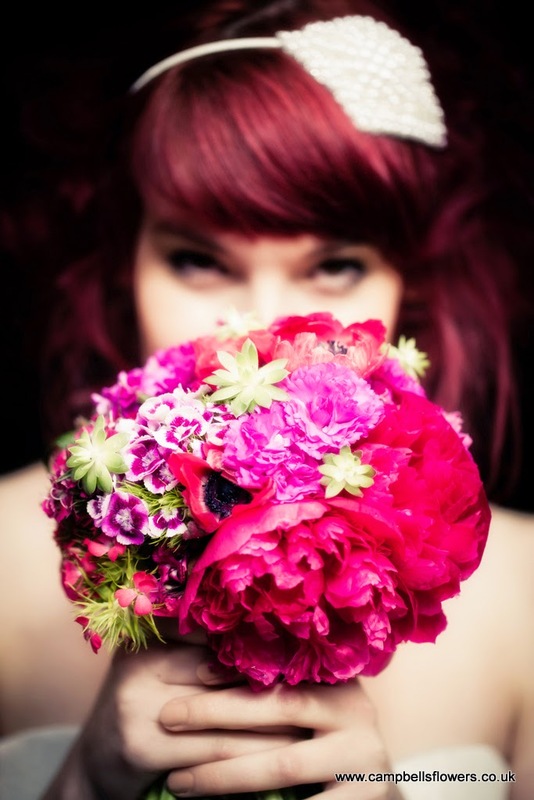 We also provided hair flowers that matched the theme of the bouquet. 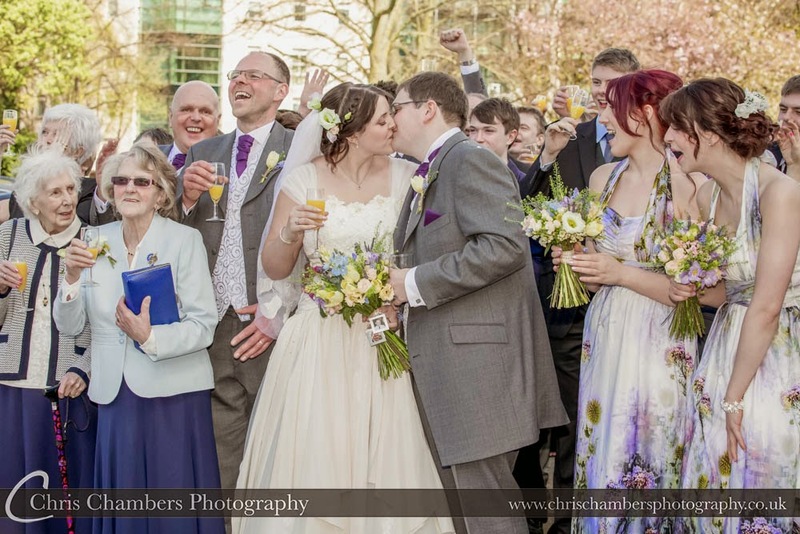 Todays we are bringing you a wedding from March 2014, spring was in the air and the day couldn't have gone better. 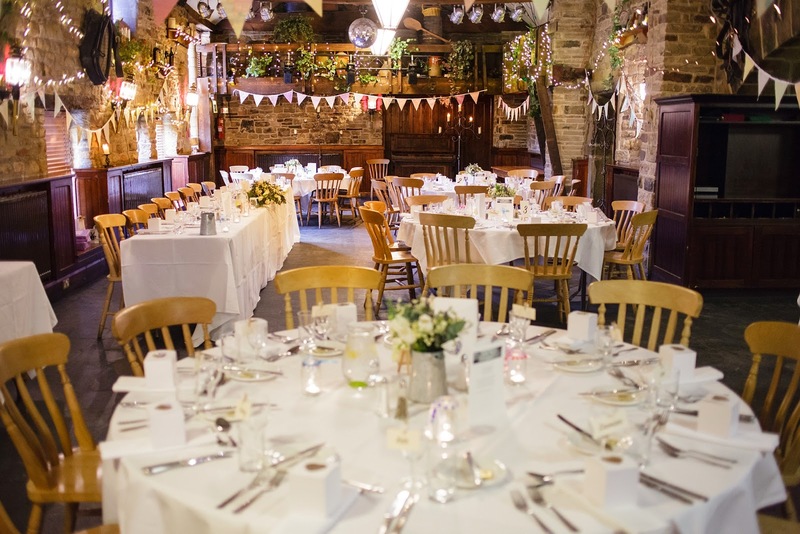 The venue was Cubley Hall, built in the 1700's Cubley Hall has retained much of its charm and character. 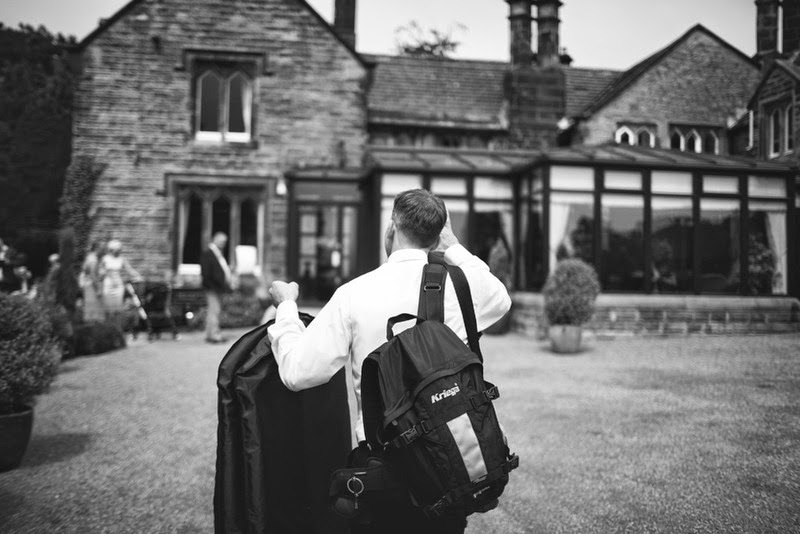 The Peak District is a very popular setting for our brides and this is such a beautiful place. You will see from the pictures that although it keeps its period features it has a very modern and lively atmosphere and has the prettiest views you ever did see! 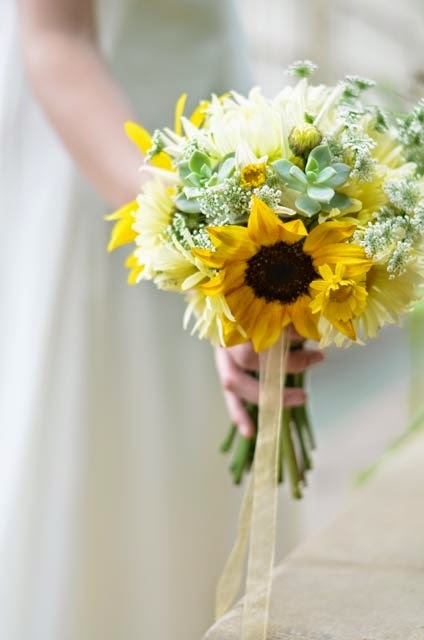 As always we can't wait to tell you all about the bride's bouquet. 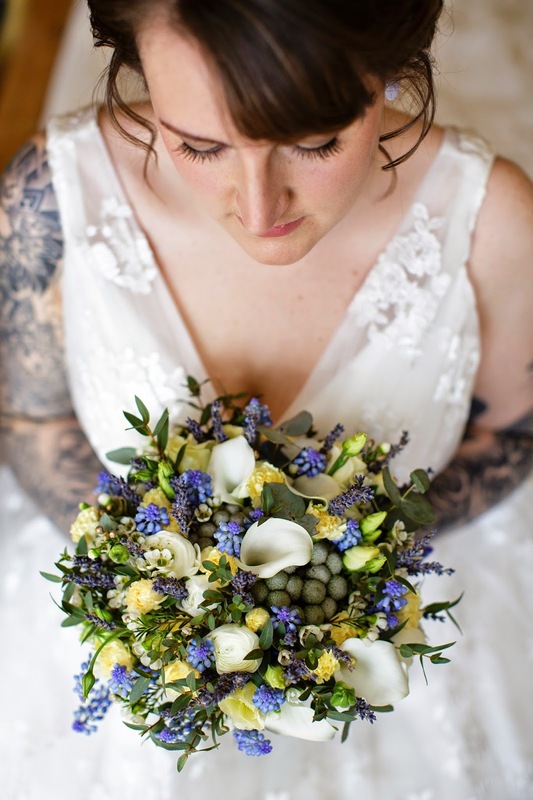 Laura wanted a very natural looking, unstructured, but pretty bouquet using blues, greys and creams. She was really interested in seasonal flowers which we always like to use anyway so we went for muscari, ranunculus, cream wax flower, lavender and a touch of eucalyptus. As both Laura's Nans are really special to her, we also included their respective favourite flowers - carnations and calla lilies. Her bouquet smelt amazing and looked stunning with her 1950's style dress. When Laura came for her consultation, her body art wasn't visible but we had an idea from her 'inky miss foster' email address that it might be wonderful to try and create flowers which in some way worked with the very beautiful and intricate black and grey designs - when we suggested this, she jumped at the our ideas! 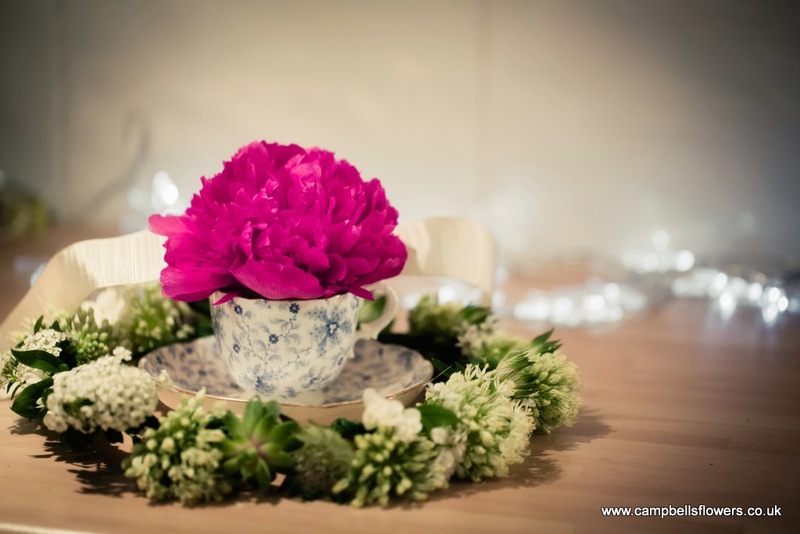 It's lovely to be back on the blog, as many of you will know Team Campbell's is growing and I've been quietly steering us into the busiest wedding season yet! 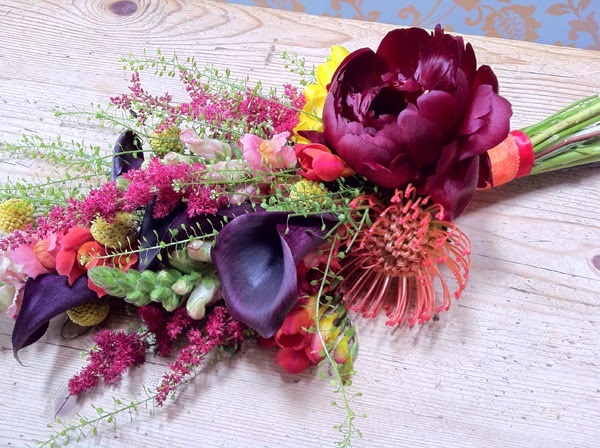 I thought I'd pop in though to just tell you all about my fantastic trip a couple of weeks ago when I got to stay with my lovely friend Anne-Marie of Posy Rosy who not only blogs the most gorgeous wedding mood boards and inspiration, but also designs the most amazing heirloom bouquets you've ever seen! She's been trying to temp me to the Temps (sorry!) for a good couple of years now and unbelievably the festival co-incided this year with a wedding free weekend. Nothing for it but to book myself a cheapy flight and pack some flats! The Temps de Flores was launched over 50 years ago as a small flower exhibition and competition, since then it has grown to attract visitors all over the world and features the most incredible installations some of which are wonderfully abstract. It's a real testament to colour, creativity and, of course, beautiful flowers which are all expected to last over a week in the warm sunshine! No mean feat I can tell you! Love a bit of arty graffiti! Everyone gets involved - children, churches, community groups, the uni - everyone ..
Gemma and Lloyd - A Nice Day for a White (and Navy) Wedding! Today we are bringing you a very recent wedding that only took place last Thursday but we just couldn't wait to tell you about it. 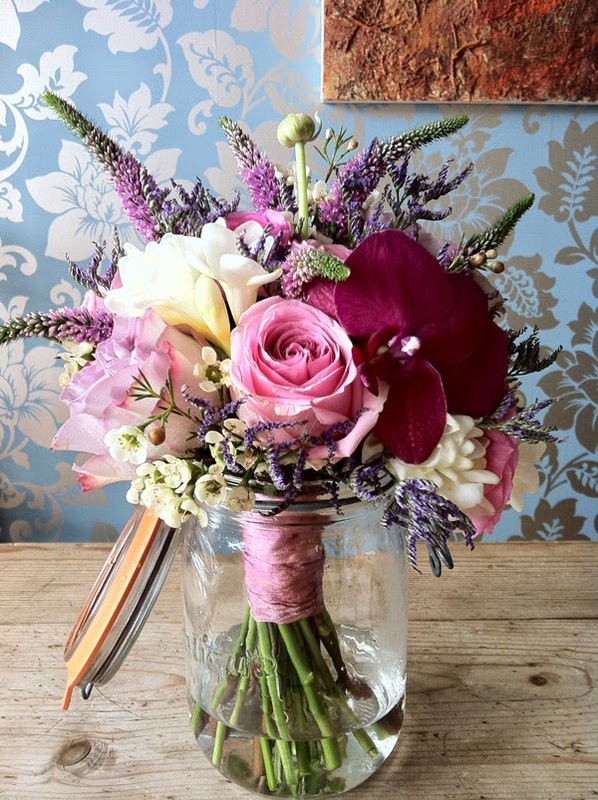 Gemma won a competition which we featured on our blog back in March 2013 - to win her bridal bouquet. Its always worth entering our competitions as you can see. 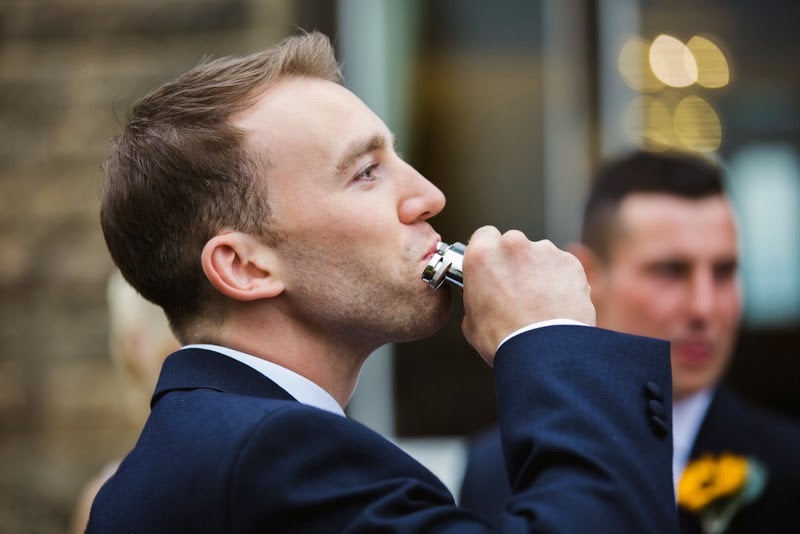 Gemma and Lloyd got married at Losehill House Hotel and Spa in the Peak District. 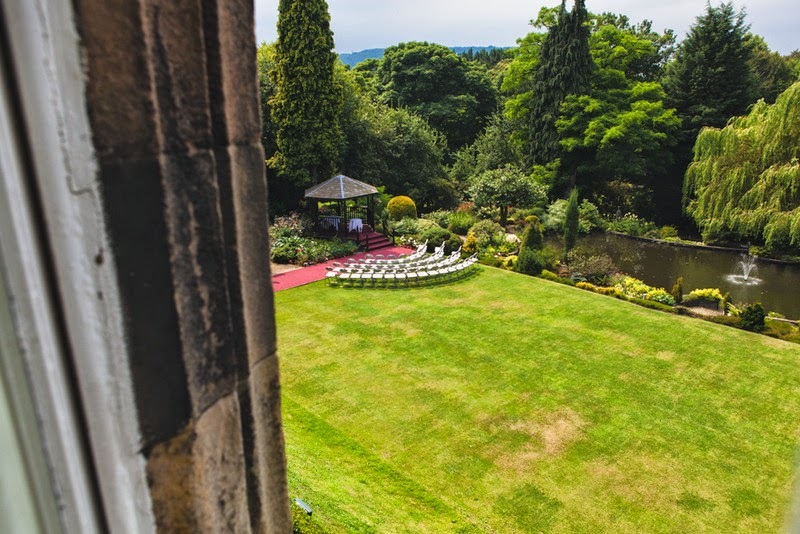 This little hidden gem has gorgeous views and is just the right size for an intimate rustic style wedding. The spa treatments are amazing and a really fab way to help you relax before your big day. Gemma had a navy and white theme using all white anemones with a gorgeous blue-black centre but they are notoriously difficult to get to open perfectly. The trick is to get them fully open but not too much as they go all revolting and slimy when too old! T went to the market nice and early and bought some on Saturday to open for Thursday which should have been spot on. However, on Monday it was clear that they didn't meet our really high standards so she ordered some more for Tuesday. They were then put on a sunny window sill, outside in the sunshine and generally nurtured (and pleaded with) so that about half of them opened in time! 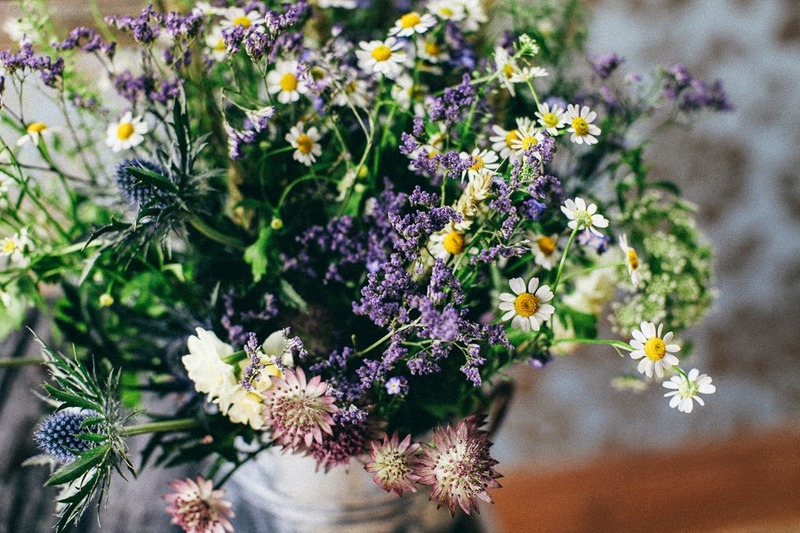 The result is gorgeous but a good indication of what a really good florist goes through to make sure that your flowers are absolutely perfect on the right day - DIY'ers you have been warned! Sticking with the all white theme of the flowers, whiter-than-white gypsophila featured strongly throughout. The bridesmaids had a simple yet stylish hand tied of Gypsophila arranged in a ball shape and the male guests had little mini button holes to match. Lloyd's button hole stood out from the rest though, and featured a single anemone with a sprig of beautiful smelling rosemary. The female guests had button holes of cream lisianthus, with lavender and rosemary - again lots of lovely scents working together. The workroom smelt amazing as we were making up. Gemma decorated little jam jars and we filled them with flowers from the theme. 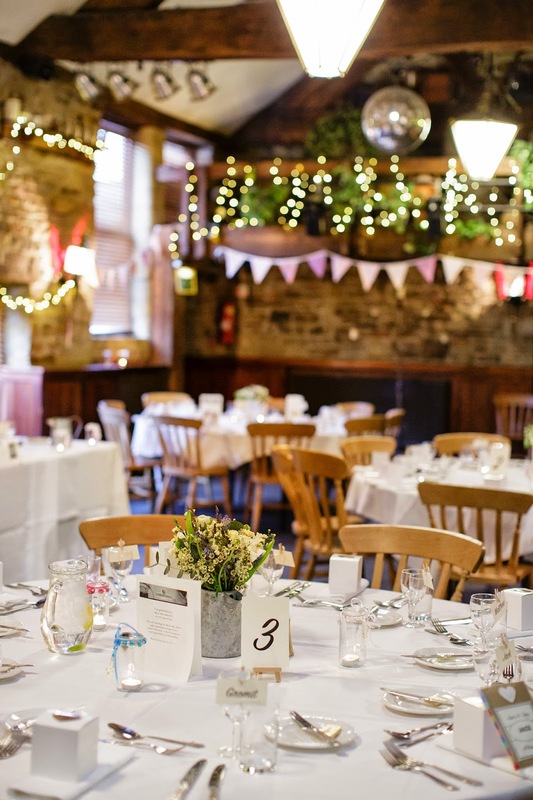 We also created a long vine-styled garland of sweet scented rosemary which was complemented with little bunches of flowers from the theme, however, the piece de resistance were the topiary table arrangements on stylish neutral cast iron candle sticks. Absolutely stunning. Although I find everything that T makes really beautiful this hanging heart has to be one of my favourites. Not only does it look stunning it smelt amazing!